Travel the plains of Kenya and Tanzania for a chance to glimpse the unique culture of the Masai tribe that inhabit these desert lands. Click here to play! 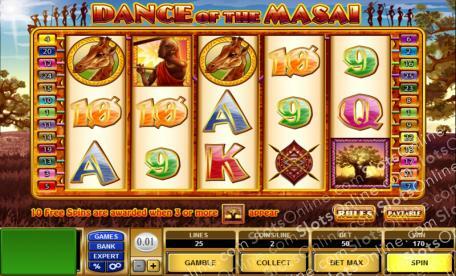 The Masai warrior rules this game and will guide you through the Kenyan landscape as you learn about his tribe. He’s a substitute that will replace most other symbols. He’ll guide you through the land where you’re sure to see plenty of wild animals. Two to five long necked giraffes will bring in a top payout worth 5,000 times your line bet. There are also little impalas grazing in the plains. Two to five of these graceful creatures will bring in 2,000 times your line bet. Masai huts and shields will also help you in your adventure through the Kenyan landscape, each one picking up up to 1,000 times your line bet. The tree is an important symbol in this game. Not only does it symbolize life, but it’s also a scatter that will multiply your total bet. It will also trigger a number of free spins if you can collect three of them anywhere on the board. Travel through Kenya and Tanzania with the Masai tribe and you could return with riches beyond belief. The tree is a scatter symbol. Spin two or more anywhere on the board to multiply your total bet by 2, 5, 20, or 200 respectively. It will also trigger 10 free spins if you can spin three or more anywhere on the board. The Masai warrior is an expanding scatter. He will replace all other symbols except scatters to help create more winning lines. If he appears on reels 2 and/or 4 during the free spin feature, he will expand to cover the entire reel.